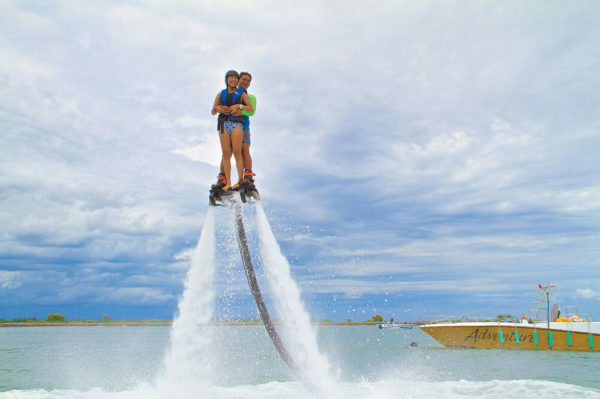 Flyboarding is the newest, extreme water sport! Flyboarding in Bali is a spectacular experience, extremely popular among tourists. You will be taking flight in the Indian Ocean and if you’re willing, you can get creative by adding in a bunch of turns, flips and the oh so infamous “Dolphin Dive.” You will get a real kick out of it! 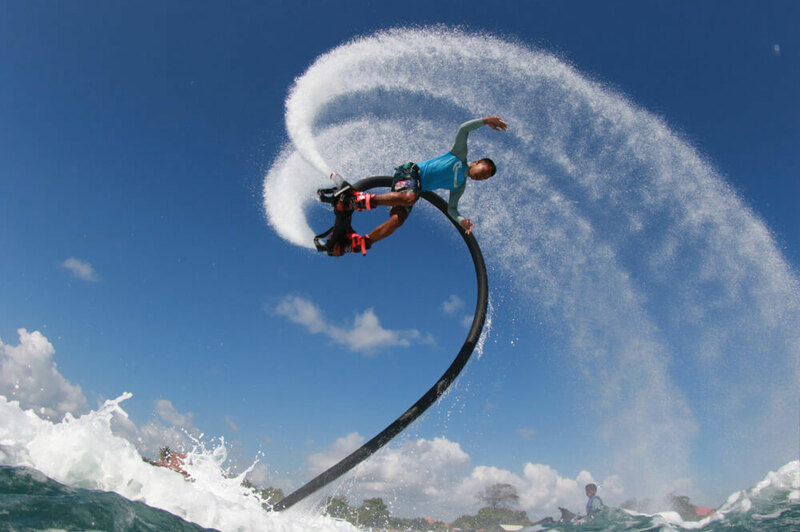 A long hose connects the flyboard to the jet ski, which powers the board and sends the rider soaring. The hydro-propulsion forces created offer a unique sensation and a total freedom of movement to the rider. Our instructor is on the jet ski and regulates hydropower. 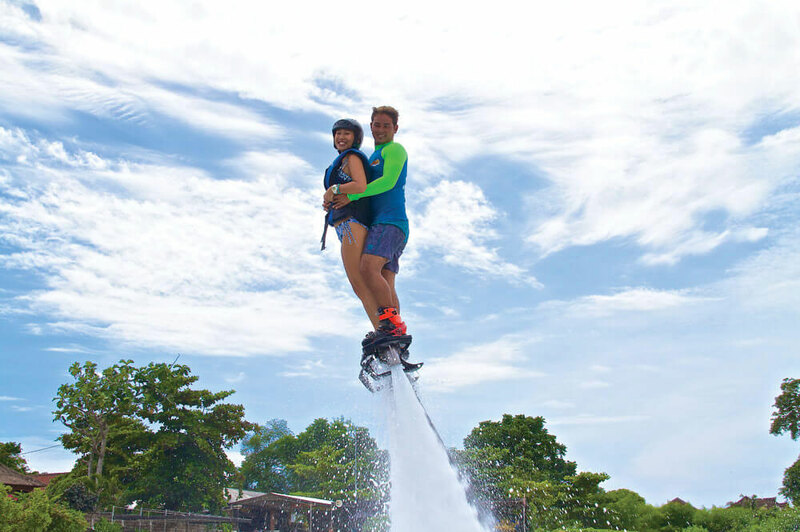 As they can adapt to the user’s level, flyboarding is a great challenge for everyone. You will improve your skills fast, as the instructor will perfectly support you. Flyboard-bali.com is part of Watersports-Bali.com. 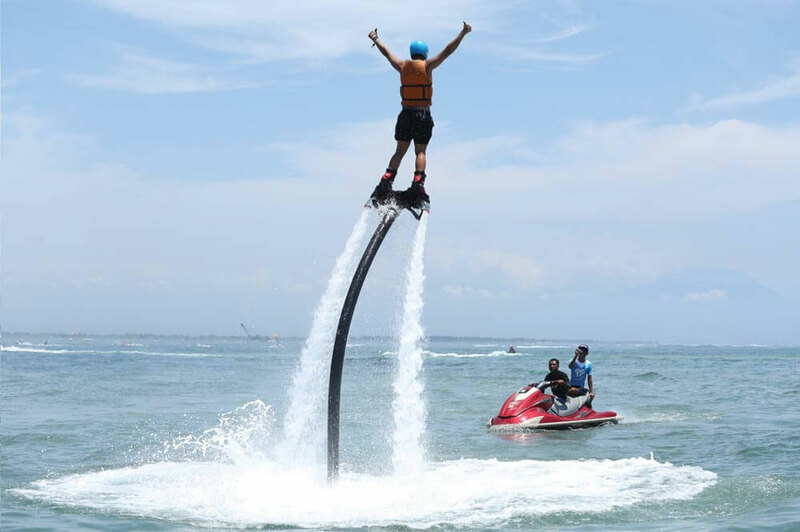 We are the first company that introduced the flyboard to tourists in Bali. 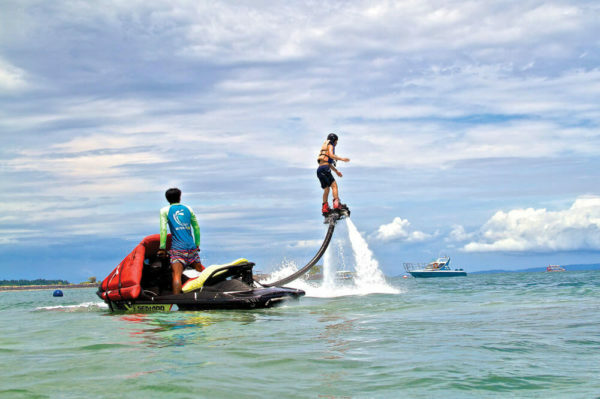 We have the latest equipment and the best flyboard instructors! Amazing experiences with you guys and thank you for Junod you’re the best navigator for us. Thank you for the great challenge and see you again. Hello Junod. Thank you for today, flyboard was an amazing experience! and I hope to flyboard with you again. Very interesting, challenging, and worth it. I hope I can joining again to play this water sport in Bali. And thank you Junod and your team. Good job for all of you. Flying board was nice, jet ski a bit boring on flat water area. And I had instructor on my back when I didn’t want one. I will return maybe Tuesday for flying board, it’s amazing experinece. Thank you for the Foto. Your Guide did verry good Job !!!!!!! ‍♂ we had a lot of fun. Too bad that there is so much garbage in the water. 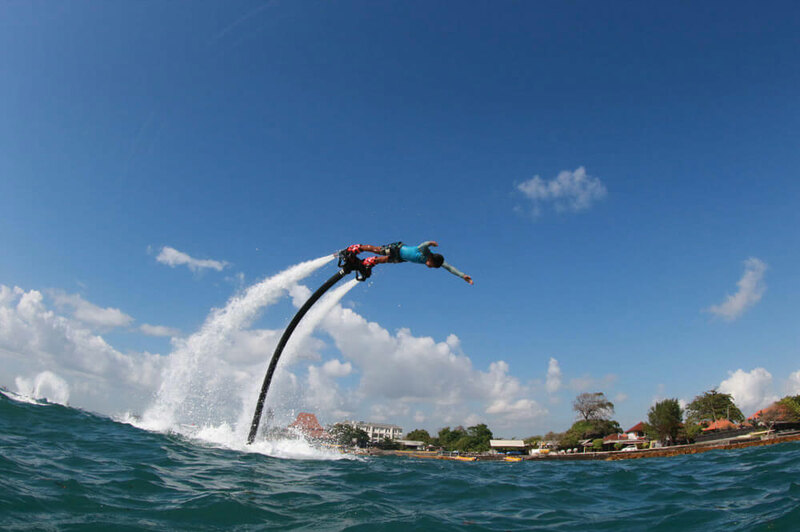 I did the flyboard for my 54th birthday and chose to do it at Bali Watersport. What an awesome experience. I was met at my hotel and taken to the site to do the flyboard. During the trip there I was able to talk with two of the staff and they were given me advice on what to expect. Once I arrived I met Kahna, which she provided me with more advice and made me feel welcome. I got ready, went out and gave it a try. Flyboarding is a challenging activity and I enjoyed myself completely. Bali Watersport has a great staff, friendly and knowledgeable. The next time I am in Bali, I will be there at Bali Watersport getting a little higher with a bigger smile. Thanks. SO much fun! I felt like Ironman – well IronWOMAN!!!! The staff was super patient and helpful, even when I got frustrated. 20 minutes sounds like not enough time BUT it was plenty as it was such a fun workout! It was awesome!!! To fly like that was an unreal experience, you really feel like you can fly. Easy to learn and so much fun. Thank you! Flyboarding was amazing, it really feel like Ironman! Thank you for your kindly instructions, we had a lot of fun. It was my second time, I love to do it! It will get better after a few rides, you are more in control to do tricks. To go diving with the flyboard was great.